One night in Bangkok.....: Spidey to the rescue. A Thai firefighter put on a Spiderman costume to rescue a superhero-loving autistic boy who climbed onto a third-floor balcony and dangled his legs over the side because he was nervous on his first day of school. Somchai Yoosabai was called in after the 11-year-old boy's teachers and mother failed to coax him off the ledge on Monday, he said in a telephone interview Wednesday. "He was nervous about the first day at school, and he was asking for his mother," Somchai said. "He cried and refused to let any of us get close to him." Overhearing a conversation between the boy's mother and his teachers about his love for comics and superheros, Somchai rushed back to the fire station to change into a Spiderman costume before swinging into action. "I told him Spiderman is here to save you. No monster will hurt you now," Somchai said. "Then I told him to walk slowly toward me. I was very nervous that he might have slipped if he got too excited and ran." 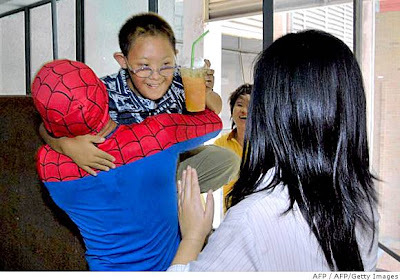 Somchai, who keeps costume of Spiderman and a Japanese superhero Ultraman to liven up fire drills at schools, said the teary-eyed boy broke into a smile and started walking into his arms.